Spanish product designer Victor Castanera has created a set of cylindrical resin containers with patterns reminiscent of ocean waves and sandy beaches. The Undae collection includes white resin vases, designed to look like sea foam and sand, and blue-and-black containers intended to resemble the changing colours of the sea. "I am passionate about the ocean since I was a kid and I have an obsession with waves and these organic stripes that the sea creates in the water, so I wanted to start my work being inspired by this," Castanera told Dezeen. The designer previously experimented with naturally occurring shapes for his Areniscos series, made from resin poured into wet sand. "I wanted to represent the textures using this process in different shapes," he added. "These shapes had to be simple to emphasise the textures and the lines of the layers." To create the vases, Castanera poured layers of resin into moulds to create containers that would be unique in texture and pattern each time. "On every layer, resin always sinks in different way and because of the material density, it's never straight," explained the designer. For the Sand collection, Castanera mixed resin with wood flour and sawdust, while for Sea he blended blue and black pigments to create different shades of colour. The containers come in a trio including two cylindrical vasers and a smaller tapered vessel. 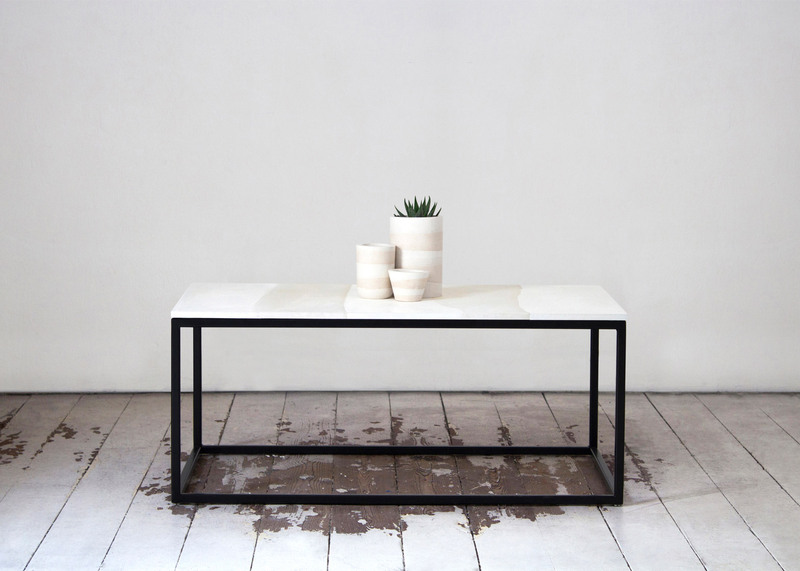 The designer also created an accompanying pair of Sand and Sea tables, which rest on simple black metal frames. These echo the colours of the vases in larger vertical stripes. Make That Studio similarly based a range of vessels on natural shapes, using the forms of water-smoothed pebbles to design a collection of unconventional jugs. Resin has also proved a popular material for other products, used by Marcin Rusak to preserve patterns of flowers for a range of furniture and lighting, and by Moreno Ratti to suspend marble shapes inside transparent blocks.